A limp courtroom drama with wooden performances and a forgettable story, Physical Evidence lands with an excruciatingly dull thud. Suspended and quick-tempered police detective Joe Paris (Burt Reynolds) wakes up one morning with a hangover and no recollection of what happened the previous night. When evidence is found in his apartment linking him to the grim murder of hated nightclub owner and mobster Jake Farley, Paris is designated as the prime suspect. Inexperienced public defendant Jenny Hudson (Theresa Russell) is assigned to the case. Grizzled prosecutor James Nicks (Ned Beatty) offers a plea bargain, but Hudson is determined to prove herself by exonerating her client. As Paris and Hudson try to uncover what happened on the night of the murder, they develop some attraction, much to the chagrin of Hudson's rich fiancé Kyle (Ted McGinley). 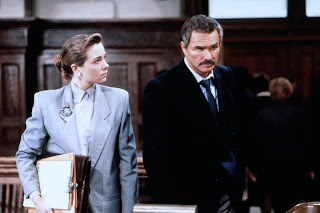 Meanwhile, the married Deborah Quinn (Kay Lenz) comes forward to offer her lover Paris an alibi, despite threats from her rich and powerful husband. Matt Farley (Tom O'Brien), the victim's son, emerges as another possible suspect, since he inherited his father's evil empire, and there is no shortage of former convicts who harbour a grudge against Paris for putting them behind bars. Originally intended as a sequel of sorts to Jagged Edge (1985), everyone associated with that project wisely bailed out, leaving Physical Evidence to wallow in its strictly derivative awfulness. The script, the directing and the performances are all just a tiny notch above TV movie tripe. There is simply nothing here that has not already been done repeatedly in other movies. The story leaves gaping holes at every turn, with underdeveloped and unconvincing characters hissing at each other in forced conniptions, doing their best to act as idiotically as possible while trying to imitate better performances from much better movies. Joe Paris' most convenient memory loss opens the door for all sort of half-baked theories to be dragged from the oven moist with drooping ingredients trying to explain who did what to whom. It never matters, since Paris is an unsympathetic character and Jenny Hudson is more likable but much more annoying. Theresa Russell delivers her lines in a catatonic monotone that suggests either a locked jaw or a mouthful of cotton, and her contrived pampered-girl-looking-to-do-good character hardly helps. For all her good intentions, Jenny Hudson simply reacts to the initiative of others and herself does absolutely nothing to help Joe Paris prove his innocence. A rather ridiculous hairdo does not help. Burt Reynolds is marginally better, but he also walks through the movie with a been-there, done-that resignation, metronomically alternating anger, temper and frustration on a carousel of stock emotions. It is left to Ned Beatty and Kay Lenz, ironically the two secondary characters who should have been the most predictable, to inject some much needed spice to the proceedings. Both bring welcome relish to their roles, with Lenz overcoming a wedged-in and unconvincing distraction about Deborah carrying on an illicit affair with Paris. Author and wannabe director Michael Crichton would not direct another movie after this one. He may have had the ambition, but the evidence was against him.